With Oscar coverage and a best actress nomination for 9 year old Wallis, does this film live up to the hype? Beasts of the Southern Wild centres on Hushpuppy, a child who lives in ‘The Bathtub,’ a Southern Delta community which is affected when the ice caps melt and the area floods. The film is shot in a hugely intimate approach, using a steady cam and for the large part from the point of view of Hushpuppy, played by the magnificent and beyond her years, Quvenzhané Wallis. In addition, extreme close ups and deliberately blurred images create a sense of trueness to the film and almost break down the fourth wall. Hushpuppy is also the narrator and gives us her internal thoughts, a device which further brings the film audience closer to the character: ‘Daddy could have turned into a tree, or a bug. There wasn’t any way to know.’ But it is this strong and focused narration which gives the film its initial edge: ‘the whole universe depends on everything fitting together just right,’ is beautifully worldly, innocent and out of place – or so it would seem. Beasts of the Southern Wild has yet another trick up its sleeve: it merges this intimate story of a girl and her father with a larger outlook and understanding of the world around them. The film incorporates extinct creatures which have been thawed by the ice caps descent and emphasise the films liberal use of realism. Unfortunately, this lack or realism and solid narrative over complicates Hushpuppy’s journey at times. 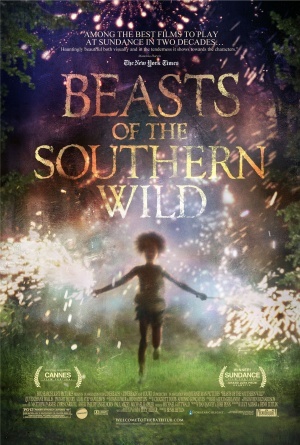 The film is an absolute triumph in direction, score and atmosphere, but the sporadic plot left a lot to be desired; a strong and unique drama, Beasts of the Southern Wild is certainly one to watch. This gained some Oscar in 2013 but did it win your affections? Let us know in the comments below.